The Gift that Keeps on Giving (308/365) – Annoyingly Boring? Kristine at Random and Odd runs a little game calling upon those taking part to take a portrait of a particular flavor of “Stuff” each week. This week’s Stuff Portrait Friday item was “A gift you have received”. I received this Mr. Beer kit last Christmas. It’s currently chock full of an Irish Stout that’s just about ready to bottle. It’s home brew paint by numbers, nothing fancy, but each batch I have brewed up has been tasty so far. Oh, and if you haven’t seen it, check out this video I made with my three oldest kids doing a bit of a demo of how you make beer with Mr. Beer. It’s pretty entertaining. You make beer? OMG. you are too damn cool! That is a cool gift. Probably is as good as a brewery place. I played too. Rupe remembers the “infamous” child labor law video from the past ….. I don’t think I have ever received a gift as cool as a beer making kit. 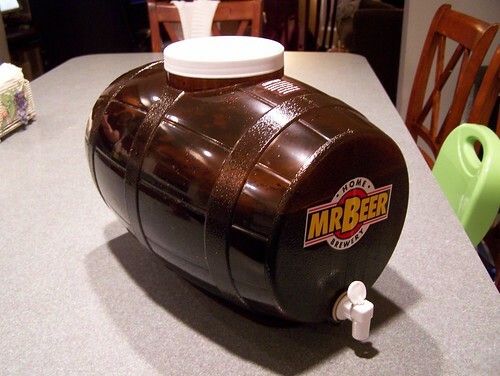 I have some Lager brewing in my Mr. Beer. I like the booster seat at the edge of the photo–an acknowledgement that Pat’s failures as a father will lead his children down a path of self-destruction.